Concise, broad, dense, insightful. The perfect main dish after an appetizer. Elements of Mathematics takes readers on a fascinating tour that begins in elementary mathematics–but, as John Stillwell shows, this subject is not as elementary or straightforward as one might think. Not all topics that are part of today’s elementary mathematics were always considered as such, and great mathematical advances and discoveries had to occur in order for certain subjects to become “elementary.” Stillwell examines elementary mathematics from a distinctive twenty-first-century viewpoint and describes not only the beauty and scope of the discipline, but also its limits. From Gaussian integers to propositional logic, Stillwell delves into arithmetic, computation, algebra, geometry, calculus, combinatorics, probability, and logic. He discusses how each area ties into more advanced topics to build mathematics as a whole. 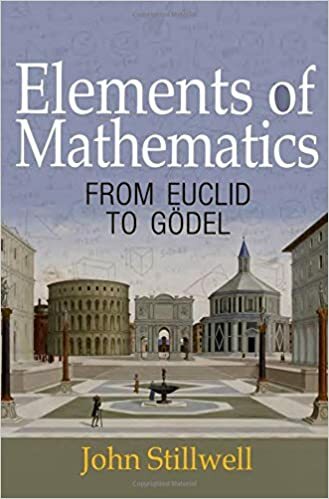 Through a rich collection of basic principles, vivid examples, and interesting problems, Stillwell demonstrates that elementary mathematics becomes advanced with the intervention of infinity. Infinity has been observed throughout mathematical history, but the recent development of “reverse mathematics” confirms that infinity is essential for proving well-known theorems, and helps to determine the nature, contours, and borders of elementary mathematics. Elements of Mathematics gives readers, from high school students to professional mathematicians, the highlights of elementary mathematics and glimpses of the parts of math beyond its boundaries. An appetizer can be something stree-free, like Paul Lockart’s Measurement. Elementary mathematics is not what most of us think it is. When I was a kid, during every summer break, my father, a math professor, would talk and draw me through the math topics of the coming semester, in a very personal and concise way. So it’s actually he, more than the teachers at school, who taught me math. And I didn’t realize how life-changing that was until decades later. What amazes me most is how my father could tell a different story about exactly the same thing that, to most students, seemed so boring in an average classroom. Many of us adults know the answer: deep insight, from a much higher-level point of view. That, I think, should be the most important takeaway from all the proper schooling we get. Felix Klein’s classic volumes, Elementary Mathematics from an Advanced Standpoint, are not always for the faint-hearted. The legendary Mathematics: Its Content, Methods and Meaning demands long-term commitment. Math, Better Explained may seem superficial and over-simplifying. So I do think Elements of Mathematics fills a gap somewhere in between. It’s dense, for sure. It demands your full attention. While the insights scattered on those 393 pages are invaluable.